« How Complex Is Dividend-Paying Whole Life Insurance? What could go wrong while your cards are maxed out? Well, if your credit cards are maxed out and you’re faced with an unexpected expense, you could be in deep weeds. For example, if your son or daughter across the country were in a serious accident and you needed money to fly there fast, you would have to either borrow it at an exorbitant interest rate, skip a credit card or mortgage payment (and take a hit on your credit score), borrow from a friend or family member (good luck with that one), or realize you simply don’t have the money to let you be with your child. If you’re living hand to mouth and someone in your family is laid off or becomes seriously ill and you can’t make your card payment, it could ultimately force you into bankruptcy. Unfortunately, this happens every day. You may not realize until it’s too late that the credit that seemed so alluring when you decided to get the new home theater system was actually your financial undoing. Then there’s the vicious circle effect: The higher your debt, the lower your credit score. The lower your credit score, the higher the rate you’ll be charged for the privilege of spending money you don’t have. You don’t have to be caught in the tentacles of never-ending debt. Our clients tell us that one of the top two reasons people adopt the Bank On Yourself method of wealth-building is to become their own source of financing. Banking on yourself gives you the ability to be your own “banker.” You can get your hands on your money quickly, with no questions asked. When you’re not using your money, it earns a competitive return. And even when you are using your money, it continues to grow as if you hadn’t touched a dime of it! In short, Bank On Yourself lets you fire your banker and become your own source of financing. Bank On Yourself is our trademarked name for a safe, guaranteed, wealth-building system based on a strategy that has successfully been used by the rich (and the not-so-rich, too) for well over a century. Using this system, you finance major purchases by borrowing against the cash value of a specially-designed dividend-paying high cash value whole life insurance policy you own. … This is not the kind of whole life insurance most financial gurus love to bash! Life insurance policy loans are noted for their competitive, typically below-market interest rates and for giving the policy owners complete discretion in both taking and repaying the loans. When you borrow, you set your repayment schedule. You can take out a loan whenever you want, for whatever reason you want. You don’t even need to complete a loan application. Just tell the life insurance company how much you need and where to send it. If you hit a rough patch and need to skip a payment or two, there’s no problem. You decide how and when your loan gets paid back. Click here to discover more reasons why borrowing against your whole life insurance policy beats every other form of consumer borrowing. We’ve really just scratched the surface here. 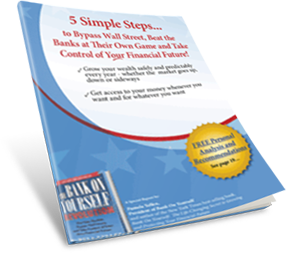 To learn more, download your own copy of our FREE Special Report 5 Simple Steps to Bypass Wall Street, Beat the Banks at Their Own Game and Take Control of Your Financial Future. To learn how a custom-tailored Bank On Yourself program can help you avoid the snares of banks and finance and credit card companies – while reaching your financial goals (there’s no cost or obligation) – request your free Analysis here. You’ll be referred to a Bank on Yourself Authorized Advisor – a life insurance agent with advanced training in this concept – who can answer all your questions and, when you’re ready, get things moving.